Where we can do nothing, do nothing. Where we do something, do it right. If we don't need to fix or change a piece of the Campbulance, we won't. An example of this would be the bench seat structure and the majority of the sliding cabinets. We can't improve upon the existing structure without an unreasonable amount of effort, so we're leaving them as is. 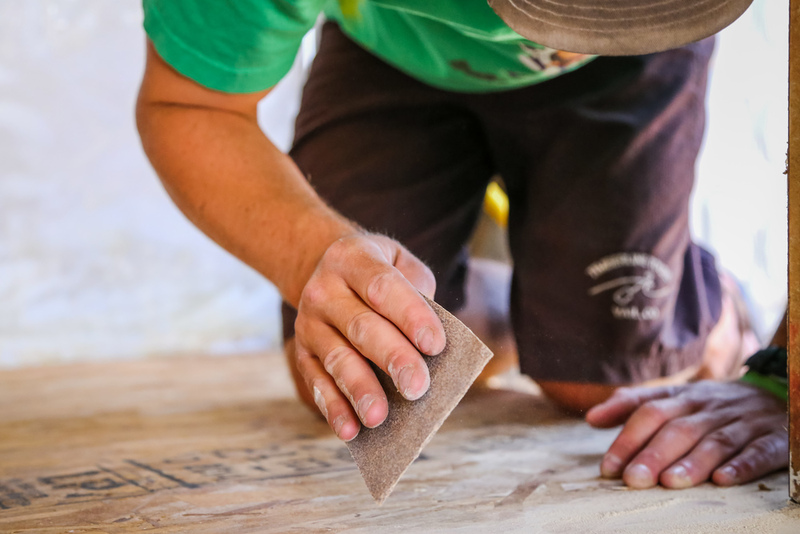 We planned on leaving the majority of the flooring by simply peeling off the original laminate, and sanding down the 3/4 inch plywood that made up the subfloor. We spent hours on this "save-the-sub-floor" project. I suppose, in the back of our minds, we knew that the right thing to do was tear the old plywood out, but we had a variety of excuses to keep us from this. Shawn's my R2 buddy. We were rookies at Vail together on Mountain Safety, and rookies at Timberline as well. He's the only one with whom I'll paddle many stretches of advanced rivers. When we're in a boat, he's the confident/overconfident one, and I'm the chickenshit. It works great. He was the one that pushed us to pull the floor. I'd heard arguments against it; I need to hear his for it. Chelsea gave us eyepatches! For safety! Shawn is performing last rites on the sub-flooring. It went quietly. Shawn did a tricky thing. He talked us into cutting out the flooring most affected by the dry rot. After the first, the first, move towards removing any peice of the sub-flooring, I was hooked. It was coming out of the Campbulance, and it was coming out now. Neither or us could figure out how the magical cutting wheel worked. We used it anyways. Sawdust is an excellent foreground. We didn't know it, but we're fighting a screw. We used a circular saw, many pry bars, even more hammer, a ball joint separator, and sweat to pull the floor out. We thought that it was only held down by adhesive, because we couldn't see any screws, but lo and behold it was the exact opposite. No (useful) glue, and hidden screws everywhere. No adhesive. Just hidden screws. HEY ASTRAL (maker of that shoe), SPONSOR ME. That's a seam, not a cut. Pulling hard, but didn't want to break anything. That cut became a HUGE problem. Cutting along the cabinet line. Pulling it out as hopefully one place. All I see is a reduction in allergens.